When I was growing up in France, people would say "bon appetit" before eating their meal. Then they would plunge their fork and knife into their thoughtfully prepared food, and talk about everything under the sun. When I moved back to the United States, I noticed people not only found less enjoyment around eating, but they spent nearly the whole meal discussing what was wrong with it! I became convinced that there was a perfect diet out here and I had to find it. You name it. I've probably tried it! When I discovered the teachings of Abraham-Hicks I was reminded about the law of attraction and why it doesn't matter WHAT we eat! WAIT, did she really just say that? You've probably noticed that there is so much "information" out there about food, that mealtime has turned into a very high-stress situation. After all, there all almost no foods that everyone can agree on. Someone, somewhere, is calling almost every food out there "POISON." "Oh I shouldn't be eating this." "I'm going to pay for this donut later." "I really shouldn't be eating this many carbs." "I hope there's no dairy in this..."
I mean, if you find a dining partner who has only positive things to say about what they are eating, consider asking them out more often. They are a rare find indeed! 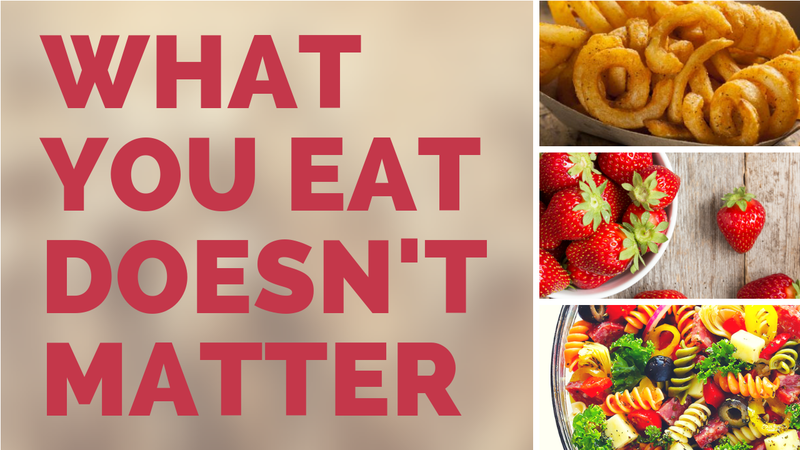 Because... how we FEEL about the food we eat is what matters. Not the food itself. Quantum physics has known for a while that it is our perception (which is shaped by our beliefs) that determines our biology. Our thoughts are responsible for our health. Can you imagine what you are thinking when you are condemning the food you are chewing in that moment? What sort of effect do you think that negativity has on your digestion? Do you see how it is backwards to look to FOOD to create health for us? Watch me explain my rather controversial position on nutrition... you may find A LOT of relief in it. So please remember to enjoy the food you are eating, and eat things that you enjoy. P.S. Here's a nice confirming quote by Yogi Bhajan: "It is not food that matters. It is the spirit behind the food, which matters. Offering a flower to a teacher is nothing. There are so many flowers but the spirit of that offering will let him stay for years with that fragrance. What you call as God is vibration. Prepare the food for your children in love. Make them to eat that. See how beautifully they grow."